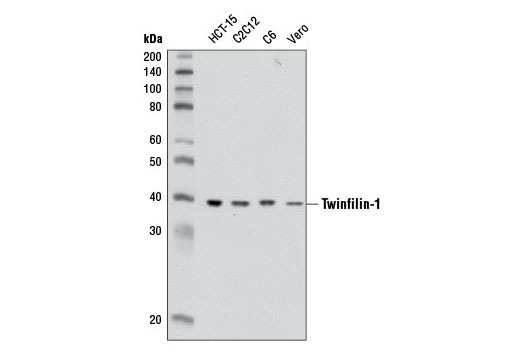 Western blot analysis of extracts from various cell lines using Twinfilin-1 Antibody. Twinfilin-1 Antibody recognizes endogenous levels of total twinfilin-1 protein. Polyclonal antibodies are produced by immunizing animals with a synthetic peptide corresponding to residues near the carboxy terminus of human twinfilin-1 protein. Antibodies are purified by protein A and peptide affinity chromatography. Twinfilin is an actin monomer-binding protein found in all eukaryotes (1). Mammals have three isoforms. Twinfilin-1 and twinfilin-2a are expressed in most non-muscle cell types, whereas twinfilin-2b is the main isoform in adult heart and skeletal muscle (2). Twinfilins are composed of two ADF-homology domains connected by a 30 kDa linker region. All twinfilins have been shown to form a 1:1 complex with G-actin, but not F-actin (reviewed in 3). Twinfilin-1 was originally known as A6 protein tyrosine kinase and thought to be part of a novel class of protein kinases. However, the protein was renamed after further studies showed no evidence of tyrosine kinase activity (4). Twinfilin-1 helps to prevent the actin filament assembly by forming a complex with actin monomers and, in mammals, has been shown to cap the filament barbed ends. It has been suggested that this regulates cell motility (5). Suppression of twinfilin-1 has also been shown to slow lymphoma cell migration to lymph nodes (6). Goode, B.L. et al. (1998) J Cell Biol 142, 723-33. Nevalainen, E.M. et al. (2009) Biochem J 417, 593-600. Palmgren, S. et al. (2002) J Cell Sci 115, 881-6. Vartiainen, M. et al. (2000) Mol Cell Biol 20, 1772-83. Helfer, E. et al. (2006) EMBO J 25, 1184-95. Meacham, C.E. et al. (2009) Nat Genet 41, 1133-7.